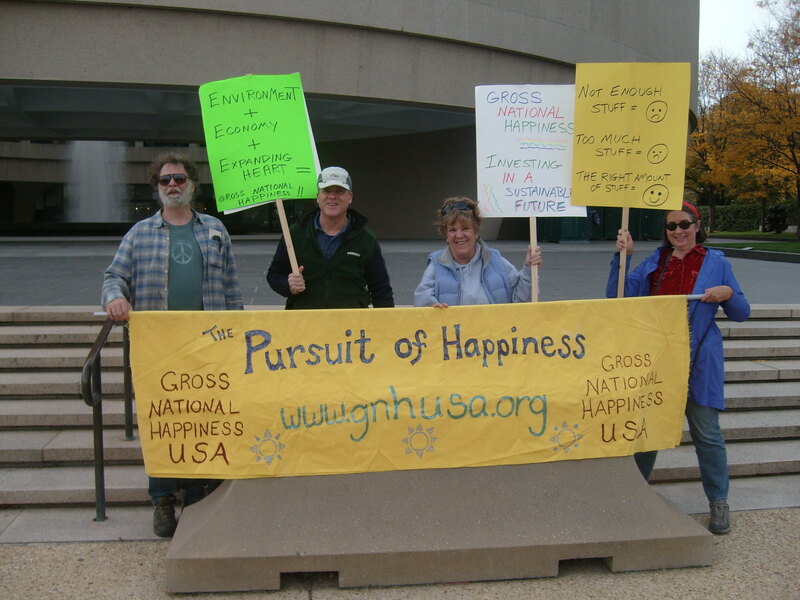 Predicting Happiness, Or, Will Participating in the People’s Climate March Make Me Happy? Marching is an act filled with happiness-inducing components: optimism, community, a sense of meaning (working for a purpose greater than oneself), being fully present and in the flow, and at the end, the reward of accomplishment. It’s not that the struggle is over — the arc on all these issues is long! — but there is a satisfaction in knowing that, at least for this moment, I was part of a job well done. In his most recent book, Flourish, Martin Seligman put forth a new theory on happiness — P.E.R.M.A., standing for Positivity, Engagement, Relationships, Meaning, and Accomplishment. All of those elements will be present when I join the (hopefully) millions and millions of people coming to New York City on September 21st for the People’s Climate March, part of the Global Weekend of Action for Climate Justice. So I should be happy about my planned participation, right? But I’m not. Okay, as I write this, I’m starting to get excited! My, my, my, the power of our brains to choose whether to be positive or negative is so awesome. But when I sat down at my laptop, I wasn’t happy about this upcoming trip — I just knew I would ultimately be happy with my decision to go. Harvard Professor Daniel Gilbert, author of Stumbling on Happiness (the first happiness book I ever read, back in 2007), writes that we are particularly bad at predicting our own happiness. He is an engaging speaker, and gives a very entertaining TED talk on this topic. I’ve watched that TED talk several times, in addition to reading the book, so perhaps some of his wisdom has been sinking in. For weeks, I’ve recognized a strong “I don’t want to go” sensation every time I think about the People’s Climate March. Part of it is inertia. Part of it is our intensely, amazing, gorgeous Vermont Septembers — definitely the best time of year to be here. It is also a time when tasks loom large. Winter is starting to breathe down our necks. It is time to put gardens to bed, to stack firewood, to get in those last few swims and kayak rides before the water gets too cold. Part of it is money: I just don’t feel like I have the extra dollars lying around to pay for a trip to New York. And a large part — very large! — is fear. I don’t mean fear of violence — I expect that day to be peaceful and loving. No, I’m afraid I’ve become a country mouse. Even though I lived for several decades in Washington, D.C. (a puny town compared with New York), I have become quite used to the ways of Vermont. The population of the whole state is just slightly more than the population of D.C. Montpelier, my closest city, is also the smallest capital in the nation, with a population numbering fewer than 8,000. I am happy to travel from quiet place to quiet place (say, my sister-in-law’s house in coastal Maine) but the idea of having to navigate New York City like a grown up is totally overwhelming. But, and here’s where Daniel Gilbert’s work comes in handy, I know if I don’t go I will really wish I had. There is nothing, nothing, more important than standing up to world leaders and demanding major, huge, significant action to ameliorate climate change right now! All our work on personal happiness and systemic happiness will do no good at all if the climate deteriorates to the point where human life is no longer possible. On September 21st, what on earth could be more important for me to be doing than adding my voice to millions more, rising up to call out for climate justice? Another ride in my kayak? Mulching a blueberry bush? Obviously, taking the steps to feel personally happier are not always the same as the path of pleasure — especially under my happiness paradigm, which encompasses not only my personal joy but also the well-being of people, animals, and the planet. To truly be happier, we need to act in accordance with our values and beliefs — do the right thing even when it is uncomfortable. My values say, I must do everything I possibly can to stop climate change — but there’s just so much I can do. By myself, I can’t get the oil companies to stop drilling for Tar Sands. I can’t afford a hybrid car. I contribute to the problem in many ways, and I need governments and big industry to establish the big systems that make future life possible. I hang my clothes up to dry, I buy local, I do what I can individually. At this point in time, individual action is no where near enough. There must be, must be massive collective action. Including me. And you, by the way. So I will be there, and I will be damned glad I am. And guess what? I will also have fun. I will hitch a ride with friends (in their hybrid car), I will spend the night with other friends. I will enjoy their company. I will enjoy the massive stimulation of New York City. Good food is a strong possibility. I will feel elated with hope. I will be part of a global community with a much greater reach than central Vermont. I will probably sing, and maybe even dance. I will feel an incredible sense of meaning, and at the end of the day, a rewarding sense of accomplishment. It will be a happy weekend. I will not “stumble” on this happiness. No, I will face my fear, and act from love — love for the planet, love for future generations, love for us all. I hope to see you there. You can give me a hug to let me know everything’s all right.